No longer content to antagonize the plucky survivors of Resident Evil's ongoing zombie apocalypse, Albert Wesker has joined the cast of Capcom's Lost Planet 2 -- that is, assuming you pre-order the game from GameStop. 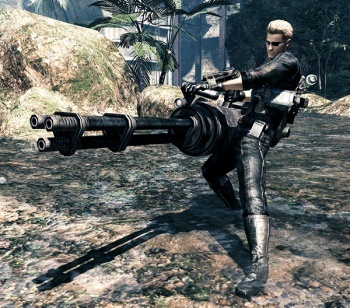 Wesker, the seemingly unkillable, T-Virus addicted sociopath, appears as a playable skin alongside an oversized revolver that looks as if its recoil would tear off your entire arm. Capcom's official announcement includes a handy pre-order link for those of you who simply can't wait to shoot at ugly bug aliens with a wildly out of place character. As much as I'm staunchly against the entire pre-order concept -- doubly so the teenage register jockeys who bother me about it every time I deign to purchase a game from any retail location -- I like this pre-order bonus. Sticking Capcom characters in the firm's other series is a neat bit of fan service and not too difficult for the developers to implement either. Still, I don't know that Wesker was the best choice for an unexpected character cameo. If Capcom really wanted to ensure droves of pre-orders, they should have skewed things a bit more esoteric. Besides, it's not like Red Arremer is doing much these days anyway.